How to deal with weeds without using harsh chemicals is a question on most gardeners’ minds this time of year. When your plants are blossoming and doing well, so are your weeds. Thankfully, there are a few different weeding strategies you can employ. One way to suppress weeds is to not give them room to grow. You can do this by planting companion plants and mulching. Tomatoes, for example, do well with basil, marigolds, and borage. A vigorous, low-maintenance herb, borage is a terrific companion plant because its roots grow the deep into the soil and pull up nitrogen. When the plant has grown, simply chop it back, leaving at least one or two leaf nodes so that the plant will continue to grow. Then, scatter this nutrient-dense green mulch around your tomatoes, basil, and marigolds — to smother any weeds that may have nosed their way in. The borage will continue to grow and you can cut them back again and re-mulch later in the season. This “chop and drop” method is easy and recycles the nutrients in your own soil, producing a better-tasting harvest. 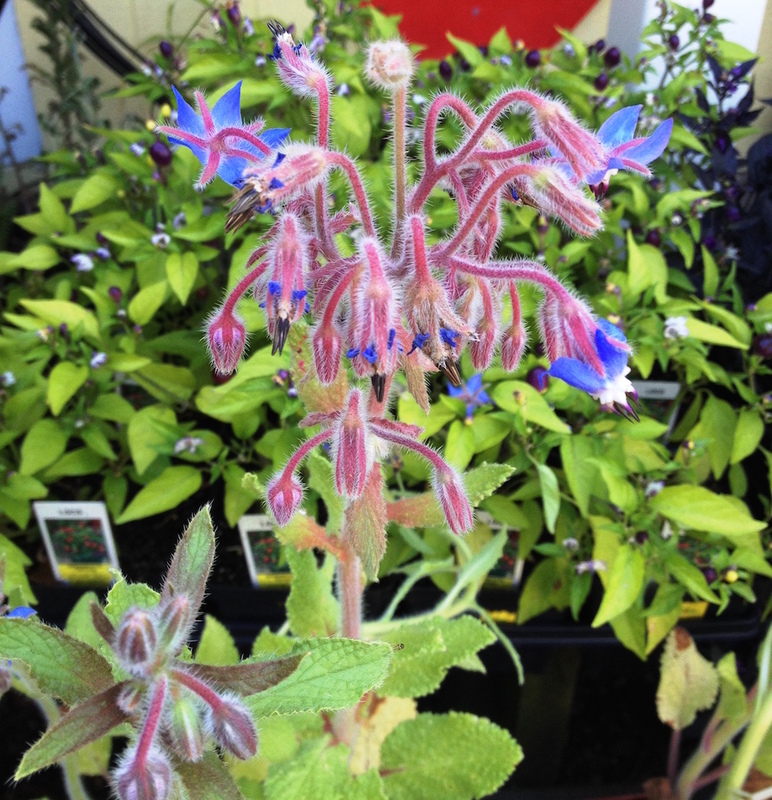 Plus, borage’s stunning blue flowers attract pollinators, and they are edible! What’s not to like? Save your back. Use long-handled hoes to excise young weeds before their roots have gotten too far established. The stirrup hoe, with a sharp stirrup-shaped blade, cuts through weeds below the surface of the soil without disturbing the plants around them. However, this method of weeding does not work with plants that can reproduce by rhizomes, like quack grass. A plant is only a weed if you call it one. Many plants that volunteer in disturbed soil like your garden beds are actually nutritious — more so than some highly cultivated greens! Goosefoot, also known as lamb’s quarters is high in calcium, phosphorus, and Vitamin A. Purslane is high in omega-3 fatty — a very uncommon trait for vegetable and also boasts healthy amounts of iron, fiber, and vitamins A, B, and C. Both of these greens can be tossed into dinner salads or soups. The common dandelion, high in fiber and vitamins A, K, and C, is a terrific green to deepen the flavor of stir fries, while its roots and flowers can be brewed as tea and a coffee substitute. Learning to identify these plants can turn weeding into harvesting. You may even see purslane used in high-end restaurants accompanying grilled fish for its mild citrusy flavor! Before you forage in your own garden, be sure you know what to look for so that you stay safe. Backyard Foraging by Ellen Zachos or online identification guides can help! Another take on weeds — even the ones you can’t eat — is demonstrated by Green String Farm in California, the go-to farm supply for the famous farm-to-table restaurant Chez Panisse. 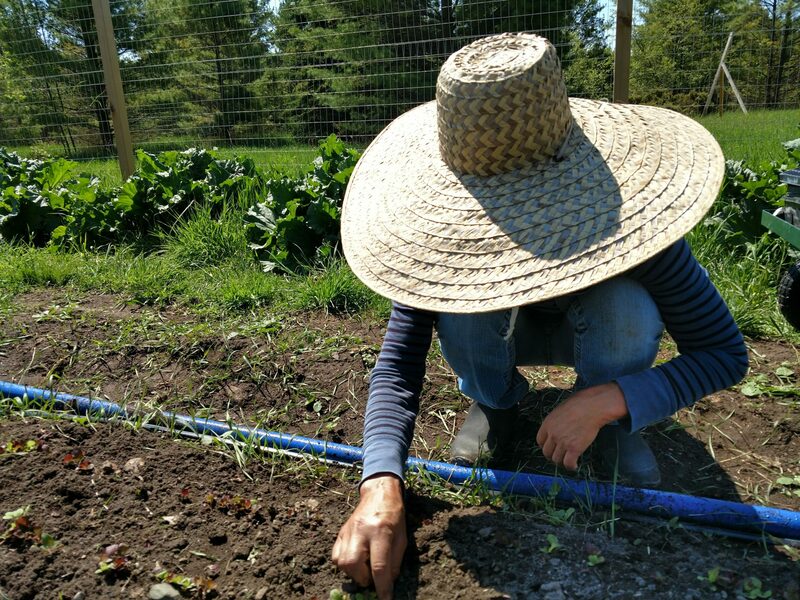 At Green String, they don’t see weeds as competition but as biodiversity, which keeps soil healthy and gives insect pests something other than your crop to be interested in. Rather than fighting the weeds, they let them grow until the weeds threaten the productivity of the crop. When the “overzealous cover crop” takes up too much space or light, they will mow or hoe the weeds, and mulch them in place. Or maybe hire a few good goats to do some munching. Let’s face it. Even with all the tricks of the trade there will be stubborn plants in your garden that you just don’t want growing. Nothing can beat them better than hand weeding. Find an ergonomic position that works for your body. Squatting, for example, is much better for your back than bending at the waist, and regular practice will improve your flexibility. Many gardeners find weeding meditative. Don’t be ashamed to treat yourself to a little quiet time alone in the garden. Finally, if you find a garden bed so overgrown with weeds that you can’t even imagine trying to pull them out, start thinking about next year. Sheet mulching — also known as “lasagna gardening” — will not only smother weeds, it will build good rich soil for use the following year. Lay down a substantial layer of browns, then a thinner layer of greens, and then a layer of compost. Repeat several times. And then let sit for a full year. The compost will help jumpstart the composting process, and the browns and greens break down into soil as they smother the living weeds. This compost-in-place method is a simple and low-input way to improve the quality of your soil while killing off weeds. This method can also be used for people looking to transition a patch of sod into a garden area. If you are concerned about the aesthetics, you can always top if off with wood chips. Just keep in mind that they will not break down as quickly over the year. When you are ready to plant, you will need to rake them away.